After speaking with some of you out there, I found that the actual Thanksgiving meal may have some awkward moments seeing family and friends that you possibly only see once or twice a year, maybe by choice, maybe due to geography. As a Public Service, this week’s Wedwand, will provide some valuable tidbits to help you through your Thanksgiving celebration dinner. Given the current state of affairs, and to keep the peace, it is advisable to avoid such topics as religion, politics and how the heck the Cubs could sweep the Mets during the regular seasons then get swept themselves in their most vital playoff series. If that topic comes up, just remember to say, “Wait until next year” like you have been saying for the last 107 years. So, you’re at the dinner table and there’s this awkward silence. This is when you say, “Uncle Dean, please pass the green bean casserole. Uncle Dean, when you’re done drinking the wine directly from the bottle, would you pass the green bean casserole? The table of guests will stop stunned and look at you unbelievingly. Some may actually applaud. Some may silently sit and admire your acumen. Uncle Dean may call for a toast and hoist the wine bottle to his lips. It is absolutely true that this side dish staple of Thanksgiving was indeed invented 60 years ago as described above. Now cranberries will come in many forms at Thanksgiving dinners. Sometimes, it is an elaborately prepared whole berry dish. Other times they are served the traditional way as at the original Thanksgiving Feast of 1620, straight from a can with the can ridges visible. Over the chorus of ooo’s and ah’s from the dinner table you continue, “The cranberry, the concord grape and blueberry are the only three fruits that have their origin in North America. The Pequot tribe originally called them “ibiimi”, meaning bitter berry. That’s why Uncle Dean seems to be muttering ibimi ibimi ibimi. He means pass the cranberries. The table erupts into applause and scattered smiles and everyone’s now happy at dinner. So there’s a few helpful hints to help through awkward dinner table silence on Thanksgiving Day. Thanks to you for reading!!! 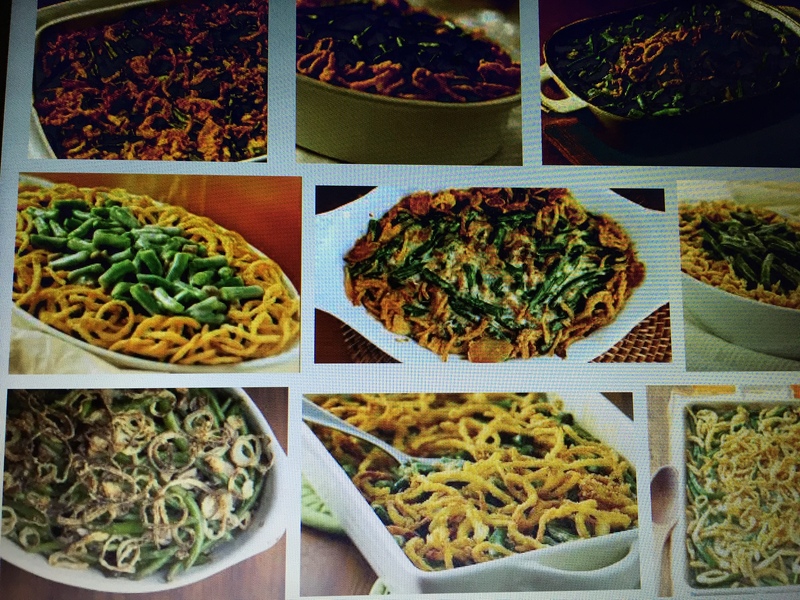 Cover photo is a Google Image search for Green Bean Casserole. My how many variations.